When designing smartwatches, manufacturers tend to miss what makes plain old watches attractive. So they come up with products that look overly geeky, have short battery life, and feel too fragile. Motorola is the only one to have come close to an appealing design with its Moto 360, but it, sadly, missed the mark in other areas. With the newly-announced Watch Urbane, LG gives the impression that it too understands that smartwatches have to look great, first of all, and then woo us with all the bells and whistles that come with the software. But does it also nail the other bits? Watch Urbane gets off on the right foot. "LG Watch Urbane is an important part of our strategy to develop wearable devices that are worn and viewed as everyday accessories, not electronic gadgets", says LG's Juno Cho. Watch Urbane doesn't resemble a luxury timepiece, as LG would love to us think, but it looks similar to some affordable, good-looking watches. The case is all-metal, which is a good start. Its 22 mm-wide strap is leather-made, making it look quite elegant. It's said to be dust and water-resistant (IP67-certified), but LG isn't saying anything about its depth-rating. Usually 100 meters is what the cheapest watches promise -- as you may know, that's good for swims, not diving. I doubt that Watch Urbane will match that. Now, what about the specs? Well, LG is quite happy to announce that Watch Urbane has the same 1.3-inch round P-OLED display as G Watch R, but with narrower bezels this time. Inside, there is a 1.2 Ghz Qualcomm Snapdragon 400 processor, which should ensure smooth navigation throughout menus and apps. 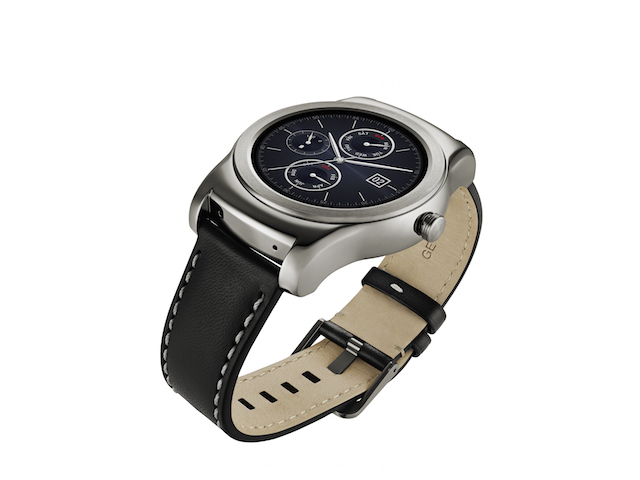 It, of course, runs Android Wear. Other specs include: 4 GB of internal storage; 512 MB of RAM; 410 mAh battery; lots of sensors (including a heart rate sensor) and physical dimensions of 45.5 x 52.2 x 10.9 mm. Watch Urbane will come in silver and gold. The former gets a black strap, while the latter comes with a brown one. LG will showcase the device at MWC next month, in Barcelona. There is no pricing information at this point, but expect it to hit store shelves for roughly the same money as G Watch R and other high-end Android Wear devices.